Mississippi Pizza offers delicious artisan pizza, house made salads, bread sticks, and desserts for your business meetings, staff parties, or other events. Our staff can consult you regarding the catering needs of your particular event. Free delivery of pizzas, salads (group or individual size), bread sticks, sodas, and fresh baked chocolate chip cookies and brownies. Free plates, napkins, parmesan, red pepper flakes, forks, and cups. Gluten-Free and Vegan pizza (now available with Daiya vegan cheese) are available. All pizzas are delivered in warming bags, which may be kept for your event and returned later that day. Monthly account billing, which includes a discount. Larger discounts on larger orders. If you need a private room at Mississippi Pizza for your parties or events, let us know! We have daily shows including live music, bingo, trivia, kid’s shows, and much more-see our event schedule. To set up a business account for monthly billing: Contact our Office@ 503.475.0011 or accounting@mississippipizza.com. We will need your business name, billing address, contact name, phone number and payment info. 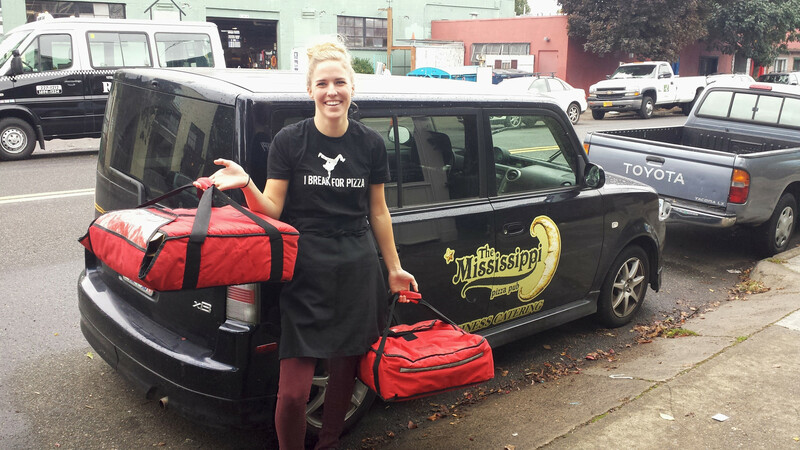 For Questions or help with large orders: Contact our General Manager Amanda Oelgart@ manager@mississippipizza.com or 503-348-9006. Have your order ready or know how many people will be in your party, and we can assist you with order quantities. (Generally an 18″ pizza feeds 4-5 adults). We’ll need your contact information, and address with detailed directions to your location. A signer needs to be available to receive the pizzas. We accept business checks, cash, and credit cards. If paying by card, please have your card number, expiration date, CVV code, and billing zip code to that card.